Do you write down everything in a diary to remind you what has to be done on which day? Do you still belong to the old school where its written and not on your mobile? I am, as I really cannot trust technology 100%. What if my mobile gets stolen, or its not charged or refuses to work for some odd reason. Well jotting down the date to post last month bread was written in my diary. I had baked the bread before leaving for London. Just didn’t get time to write the post and thought amidst all the wedding preparation I will be able to get away and blog for a while. I was mistaken. As a food blogger, people have a lot of expectations. I got busy cooking for a huge family and friends. Suddenly bakes by fellow bloggers appeared on Facebook and every other social media. I felt so sad, especially when I had already baked it, photographed it and eaten it!Anyway, there is a lesson to be learnt, what can be done tomorrow, do it now. I am also learning to use my mobile for reminders. The October Bread Bakers theme is Hearty Fall Breads hosted by Wendy of A Day in the Life on the Farm. Thank you Wendy for a this lovely theme. Though we don’t have fall, the theme has given me the opportunity to bake with pumpkin which I have not done so before. We get pumpkin practically throughout the year. Its a much ignored vegetable or rather fruit. It is usually used as a side dish instead of potatoes, made into a soup or the tender leaves are used to make a local dish called mukimo. I decided to bake a pumpkin yeast bread and began my search for the perfect recipe. The light orange hue and well risen loaf baked by Killer Bunnies.inc tempted me try her recipe out with a few additions of my own. I didn’t get the orange hued bread as the brown sugar I used is dark. While the bread was baking, my whole house smelt of the delightful aroma of the spices. The dough became a bit soft to handle after the first rise. Tried to handle it with as little flour as possible. I could not shape it well so decided to make a ball and dumped it into a cake tin. But the end result was really delicious and hubby dear loved it. NB : I roasted the sliced pumpkin in the oven at 180°C for 30 minutes. Scooped out the flesh and meshed it. This way I got pumpkin puree that was thick. Soak the raisins in warm water for 30 minutes or till they become plump. Drain out any extra water. Sift both the flours, spices and salt together into a bowl. Add yeast and sugar. Mix the flour. Mix the pumpkin puree with the warm milk. Add the pumpkin mixture to the flour and bring it together with a spatula. I kneaded the dough using my dough machine. Let it knead for 5 minutes. At intervals keep on adding a bit of butter. Dust the worktop or board with flour. Form the dough into a big ball. Grease the bowl lightly with butter. Place the dough in the bowl. Cover it with a cling film and keep it in a warm place. The dough should become double the size. Mine took about 1hr and 30 minutes. Dust the worktop or board with flour again. Knead the dough gently. Grease a round tin (8 to 10″) or a loaf tin (9 X 5″) with butter or oil. Shape the dough and place it in the tin. Cover it with a tea towel or a shower cap. Let it rise again till the top rises about an inch above the rim of the loaf tin or till its double the size. Mine took only 40 minutes. Place the tin in the hot oven to bake. Bake for 20 minutes and check the bread. If the top is already golden brown, then cover it with a foil. Bake for another 10 -15 minutes. Remove the tin from the oven. Place the loaf on a wire rack to cool. To make pumpkin puree at home, I cut the pumpkin into pieces. Scooped out the seeds and fiber. Brushed it with oil. Placed the pieces in a baking tray and roasted it for 25 -30 minutes at 180°C. Scooped out the flesh and mashed it completely. If you add an egg to the dough, reduce the amount of milk. ¼ cup each of raisins and walnuts were too little. I would definitely add more next time. Serve the bread toasted with butter, jam or marmalade of your choice. Nice texture and spices in your bread. Lovely colour and love the use of spices in your make Mayuri! I can imagine the aroma that must have filled your kitchen with all the lovely spice you have added.The bread looks gorgeous. Lovely bread.. I love the spice flavours in this bread.. This bread looks gorgeous and delicious. I love bread with tons of goodies in it! Thank you Renee, loved the smell of the spices while the bread was baking. Thank you Nayna. It was a wonderful spice filled bread. Hubby is pestering me to make it again. Thank you Julie, though I will be adding more nuts and raisins next time. Thank you Sharanya. It was delicious and tasted even better when we toasted the slices and had it with butter. Thank you Wendy. Loved the theme you chose for us. Love all the spices and nuts in this bread! I use my phone and laptop for almost everything blogging, except when I'm experimenting with recipes, in which case I use a pen and notepad and make a mess of it in the kitchen. 🙂 I will take this bread warm with extra butter, please! Looks delicious! This pumpkin bread looks amazing! Reminds me of the bread my grandma used to make when i was little. Love all the spices you used, sounds delicious! Lovely loaf, and the pumpkin puree is a great addition, I am always looking for ways to make my loaves more interesting. Superb bread, lovely color and texture, I have still not made a pumpkin bread, will try one soon. Wow, what an yummy looking pumpkin yeast bread. Looks awesome. Beautiful bread, just loving that texture..
What a beautiful bread! It looks so rich and full of flavor. Thanks for sharing it. Such a gorgeous bread Mayuri!! Love the crumb! I bet it tastes wonderful too! 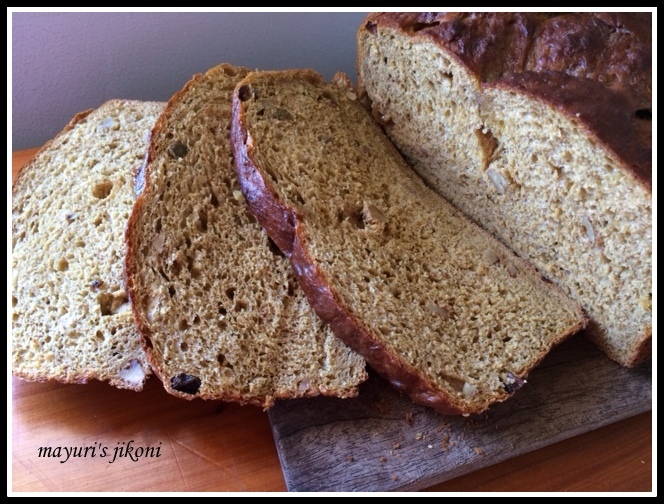 super bread.. love the top color n flavours in this bread..
wow… pumpkin bread! never heard of it… looks perfect!